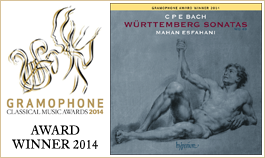 Hyperion is delighted to present the debut recording of the wonderful young harpsichordist Mahan Esfahani. He was the first harpsichordist to be named a BBC New Generation Artist or to be awarded a fellowship prize by the Borletti-Buitoni Trust. «Technique extraordinairement réactive, sens inné du son, sensibilité merveilleusement communicative : un tel rayonnement est chose rare … dans sa notice, Esfahani se livre à une analyse des mouvements extrêmement argumentée, qui témoigne d’une maturité saisissante. On a rarement entendu un Bach aussi près du texte et pourtant si libre, sidérant d’aisance dans les pages brillantes et débordant de tendresse dans les adagios. The music of Carl Philipp Emanuel Bach provides valuable food for thought when considering the overly simplistic divide between the ‘Baroque’ and ‘Classical’ periods, itself resulting from a modern standardization of performed repertoire. According to the most simplified form of this view, the Baroque is meant to end with the death of J S Bach—an atypical composer for the period in any case—in 1750, and then the Classical Age comes to maturity with the later symphonies and quartets of Haydn sometime around 1770. To deal with the messy period in-between a host of often unsatisfactory and stopgap terms have been invented: ‘transitional’, ‘Rococo’, and—the worst of them—‘pre-Classical’. 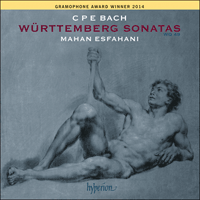 So what are we to make of C P E Bach’s ‘Württemberg’ sonatas? Written in 1742–3 (and published in 1744, with a dedication to the composer’s former student the Duke of Württemberg), before J S Bach had composed a number of his important late works, they are too well written, too convincing and too beautiful to be categororized merely as manifesting a transition from one great period to another. How do we account for the fact that the musical language of these sonatas is so completely different from that of the High Baroque which supposedly had another six or so years to flourish? Are our categories even relevant? Have we decided to ignore some truly great music because of our inability to question our simplified model of music history? Simply put, what are we missing out on? With the first sonata in the collection, the Sonata in A minor, Carl Philipp Emanuel Bach makes the most combative statement possible to assert his new musical language. The opening melody of the first movement could just as well be a brash violin solo by Vivaldi, so fresh and piquant is its flavour. So ambitious is its scope that in fewer than three bars the soprano voice twice spans the range of an eleventh. In true Sturm und Drang fashion, mood swings define the basic logic of the movement, as fiery magic is juxtaposed with moments of almost saccharine sweetness. Immediately before a recapitulation of the principal theme, Bach uses a melodic fragment based on a rising arpeggio accompanied by increasing dissonance in the left hand, thus creating the impression of a rising crescendo in a manner maximizing the harpsichord’s properties. The following Andante could almost be a transcription from a chamber work, a trio for two treble instruments and an accompanying bass. The spirited third movement makes as revolutionary a statement as the first, and is defined by a sense of animalistic turbulence. The driving pulse of the opening bars is met halfway through the first (repeated) section by a daring descending cascade of semiquavers, which then forms the chief idea of the conclusion of each half. The result is a work of stunning brilliance. Perhaps Emanuel had in mind the pyrotechnics of Domenico Scarlatti’s already famous Essercizi of 1737, which he could easily have ordered from Paris. In contrast to the fiery tones of the first sonata, the Sonata in A flat major reveals C P E Bach’s gift for imitating the nuances of the human voice through the medium of the harpsichord. A rising opening melody is followed by a quick second theme whose intensity acts as a contrast to the virtual trio of singers heard at the beginning. Bach’s uniquely wayward musical personality is evident at certain points, such as the ending of the first half of the first movement when the music moves into a minor tonality and the emotionally charged cantabile is given dramatic impetus by the use of dissonance. Contrasts of mood are further explored in the second movement, a touching piece where the flittering between unrelated motifs almost ‘decomposes’ into quasi-recitative. Bach’s literary influences are apparent here, as he blurs the line between prosody and poetry. A sense of declamation is again evident in the final Allegro. Here the master of the intense and dramatic shows us that he has an equally developed sense of humour. What this lively dance for the fingers lacks in ‘Bachian’ counterpoint it gains in a very different kind of interplay—namely, that of timbres and Affekts. In the first movement of the Sonata in E minor Bach plays upon the listener’s expectations of the behaviour and role meant to be played by a ‘principal theme’. What is the main theme of this movement? The bizarrely jagged gestures of the first five bars? Or the strings of repeated quavers, with arabesques imitated between the two hands, and relentless sighs that follow? Must a movement even have a definable principal theme? This ambiguous sense of motivic papillonnage is further explored in the middle Adagio in which the opening four-bar theme is ingeniously extended through an exploration of the contrasting colours afforded by the harpsichord’s two manuals. There follows a beautifully wrought Vivace in 3/8 time. More than any other movement in the Württemberg set, this movement calls upon the German manner of virtually carving melodies out of hard stone, in contrast to the light pastels and varied brushstrokes of Italian and French music. This is a dance of death, a true Totentanz of the Enlightenment, portraying a restless dancer accompanied by the most sinister Greek chorus of antiquity. Each half of the movement gives way to a fleet coda in which each semiquaver is possessed by a diabolical delight in the dissonant and the bizarre. The brilliant Sonata in E flat major is one of the most sunny and extroverted utterances of the mid-eighteenth century. The first movement is characterized by its varied melodic contour, giving the impression of a fish leaping out of the water in the first bar, then falling immediately back in, and on each successive jump leaping and frolicking in a slightly different way. In contrast to this playful first idea, a second theme enters with great pathos, giving way once more to a feeling of elation stated in the most flamboyant manner with descending cascades of notes. Here Emanuel Bach truly shows his mettle as the master of a new aesthetic, as he uses unprepared chords, whether consonant or dissonant, to underline the affective momentum of his melodies. No longer must a composer depend on the Baroque method by which harmonies occur as a confluence of prepared contrapuntal lines. The second movement’s fugal quality recalls the middle movement of the previous sonata in B flat major. As with that work, the idea of fugue is used as a topos or prop in order to highlight certain emotionally charged intervals, in this case an ascending seventh followed by a descending semitone in the opening theme. Bach uses a secondary theme in running semiquavers to give harmonic momentum and put the first theme into metrical relief. The splendid third movement combines virtuosity with a cheeky sense for drama as a repeating-note figure propels moments of suspense. The composer makes use of the contrast between the rich lower register of the keyboard and the fast-speaking higher register’s shrill cantabile. The last of the set to be written, the Sonata in B minor is perhaps the most representative of Emanuel Bach’s Janus-like musical personality, characterized by a tendency to look forward to new developments in musical style while paying homage to the training he received at the hands of his illustrious father. The first movement sets the stage in dramatic fashion with what is essentially an extended recitativo accompagnato as if for solo voice and orchestra (each respectively implied by the composer’s specific indications for piano and forte manuals of the harpsichord). Perhaps Bach had in mind the operas and dramatic scenes of his Berlin contemporary Carl Heinrich Graun, whose celebrated Cesare e Cleopatra had opened the Royal Court Opera in Berlin two years previously. The entire movement is a study in imperfect resolutions and melodic motifs stopping in mid-air. 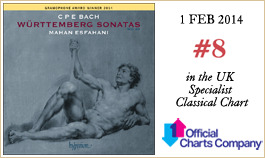 Bach brilliantly manipulates and magnifies the tension by juxtaposing each point of melodic resolution with an immediate musical question mark or pause. This is followed by a second movement of disarming tenderness. The principal theme is essentially a sequence of sighs, followed by a dotted secondary theme that at first seems wonderfully chirpy but which with each return of the sighs acquires a quality of poignancy. Finally, sadness seems to win the day as the closing bars of dotted rhythms lead us back to the opening Affekt. The final movement is a perfect two-part invention, the first piece in the entire collection that can be said to belong truly to the High Baroque. With the nearly endless rising modulation in the second half, however, Emanuel seems to be mocking the old style a bit as he follows counterpoint to its most ridiculously over-the-top narrative conclusion. The final eighteen bars, following a fermata, are achieved in a poker-faced manner—technically perfect and cool-headed, but perhaps with a smirk left over from the jokes of the previous bars. Or perhaps there is no ridiculing after all. After a trip to the opera in the first two movements, Emanuel Bach pays tribute to the greatest composer of them all—his father. Maybe he is saying that a two-part invention is ultimately worth more than all the pretty costumes and set designs in the world. La musique de Carl Philipp Emanuel Bach offre une précieuse matière à réflexion à qui veut réviser la scission par trop simpliste opérée entre les périodes «baroque» et «classique»—une conséquence de la standardisation moderne du répertoire joué. Dans la vision la plus simplifiée des choses, le baroque est censé finir avec la mort de J. S. Bach—un compositeur de toute façon atypique pour l’époque—, en 1750; puis la période classique arrive à maturité avec les symphonies et quatuors de Joseph Haydn, vers 1770. Pour évoquer le confus entre-deux, nombre de termes bouche-trous, souvent peu satisfaisants, ont été inventés: «transitionnel», «rococo» et, le pire de tous, «préclassique». Que penser, dès lors, des sonates württembergeoises de C. P. E. Bach? Rédigées en 1742–3 (et parues en 1744, avec une dédicace à l’ancien élève du compositeur, le duc de Württemberg), avant que J. S. Bach eût composé plusieurs de ses œuvres tardives majeures, elles sont trop bien écrites, trop convaincantes et trop belles pour se voir simplement rangées parmi les manifestations d’une transition entre deux grandes périodes. Comment expliquer que leur vocabulaire musical soit aux antipodes de celui du haut baroque, pourtant supposé fleurir pendant quelque six ans encore? Nos catégories sont-elles même seulement pertinentes? Avons-nous décidé d’ignorer une musique authentiquement grande parce que nous sommes incapables de remettre en question notre conception simplifiée de l’histoire de la musique? Pour dire les choses simplement, à côté de quoi passons-nous? Avec la Sonate en la mineur, la première du recueil, Carl Philipp Emanuel Bach affirme, de la manière la plus combative qui soit, son nouveau langage musical. La mélodie inaugurale du premier mouvement pourrait être un impétueux solo de violon vivaldien, tant son parfum est frais, mordant. Son ambition est telle qu’en moins de trois mesures, la voix de soprano couvre deux fois l’étendue d’une onzième. Dans le pur style Sturm und Drang, les changements d’atmosphère définissent la logique fondamentale du mouvement, une magie ardente venant se juxtaposer à des moments d’une douceur presque sirupeuse. Juste avant de réexposer le thème principal, Bach utilise un fragment mélodique fondé sur un arpège ascendant escorté d’une dissonance croissante à la main gauche, d’où une impression de crescendo ascendant—une manière de maximiser les propriétés du clavecin. L’Andante suivant pourrait presque être transcrit d’une œuvre de chambre, un trio pour deux instruments de tessiture aiguë et une basse accompagnante. Le fougueux troisième mouvement fait une déclaration aussi révolutionnaire que le premier et se définit par une certaine turbulence animale. À mi-chemin de la première section (répétée), le rythme battant des mesures liminaires rencontre une audacieuse cascade descendante de doubles croches, qui forme ensuite l’idée principale de la conclusion de chacune des moitiés. Le résultat est une œuvre d’un éclat étonnant. Peut-être Emanuel avait-il en tête la pyrotechnie des déjà célèbres Essercizi (1737) de Domenico Scarlatti, qu’il avait pu facilement commander à Paris. Par contraste avec l’ardeur de cette première sonate, la Sonate en la bémol majeur révèle combien C. P. E. Bach était doué pour imiter les nuances de la voix humaine via le registre médium du clavecin. À une mélodie ascendante succède un second thème rapide, dont l’intensité tranche avec le trio de chanteurs virtuel du début. La personnalité musicale remarquablement imprévisible de Bach est, à certains moments, flagrante, comme à la fin de la première moitié du premier mouvement, quand la musique passe au mineur et que le cantabile chargé d’émotion se voit insuffler un élan dramatique par le recours à la dissonance. Les contrastes de climat sont explorés plus avant dans le deuxième mouvement, morceau touchant où le volettement entre des motifs non connexes se «décompose» presque en quasi-récitatif. Voilà un Bach aux influences littéraires évidentes, qui brouille la frontière entre prosodie et poésie. Le sentiment de déclamation se fait de nouveau patent dans l’Allegro final. Ici, le maître de l’intense et du tragique nous montre qu’il a un sens de l’humour tout aussi développé. Tout ce que cette entraînante danse pour les doigts n’a pas en contrepoint «bachien», elle le gagne dans un tout autre type de jeu—entre les timbres, les Affekts. Dans le premier mouvement de la Sonate en mi mineur, Bach joue sur ce qu’un auditeur attend d’un «thème principal» (son comportement, son rôle). Quel est-il donc ici? Les gestes singulièrement irréguliers des cinq premières mesures? Ou bien les kyrielles de croches répétées, avec des arabesques imitées entre les deux mains, et les incessants soupirs qui suivent? Un mouvement doit-il même avoir un thème principal définissable? Cette sensation ambiguë de papillonnage motivique est sondée plus avant dans l’Adagio central, où le thème inaugural de quatre mesures est ingénieusement prolongé via l’exploration des couleurs contrastives offertes par les deux manuels du clavecin. Arrive alors un Vivace à 3/8 merveilleusement ciselé. Plus que tout autre mouvement du corpus württembergeois, celui-ci fait appel à la manière qu’ont les Allemands de tailler les mélodies dans la pierre dure, en total contraste avec les pastels clairs et les traits de pinceau variés des musiques italienne et française. C’est une danse de la mort, une véritable Totentanz du siècle des lumières, portrait d’un danseur nerveux accompagné du plus sinistre chœur grec de toute l’antiquité. Chaque moitié de mouvement cède la place à une coda véloce, où la moindre double croche se complaît diaboliquement dans le dissonant et le bizarre. La brillante Sonate en mi bémol majeur est l’une des déclarations les plus radieuses et les plus extraverties des années 1750. Son premier mouvement se caractérise par un contour mélodique varié, donnant l’impression d’un poisson qui jaillit hors de l’eau dans la première mesure pour y retomber aussitôt puis bondir et s’égayer d’une manière légèrement différente à chaque nouveau saut. Par contraste avec cette première idée enjouée, un deuxième thème entre à grand renfort de pathos mais cède, là encore, devant un sentiment d’euphorie énoncé avec une flamboyance extrême dans des cascades de notes descendantes. Emanuel Bach montre là, véritablement, de quoi il est capable en tant que maître d’une esthétique nouvelle: il recourt à des accords non préparés, consonants ou dissonants, pour souligner l’élan affectif de ses mélodies. Un compositeur n’a plus à dépendre de la méthode baroque voulant que les harmonies soient comme une confluence de lignes contrapuntiques préparées. La qualité fuguée du deuxième mouvement rappelle le mouvement central de la sonate précédente en si bémol majeur, où l’idée de la fugue sert aussi de topos, d’étai pour mettre en lumière certains intervalles chargés d’émotion—ici, une septième ascendante suivie d’un demi-ton descendant, dans le thème inaugural. Bach utilise un thème secondaire, en doubles croches continues, pour donner de l’élan harmonique et soulager métriquement le premier thème. Le splendide troisième mouvement mêle à la virtuosité un impertinent sens du drame, une figure de notes répétées servant à propulser des moments de suspense. Bach utilise le contraste entre le riche registre inférieur du clavier et le perçant cantabile du registre supérieur, au débit rapide. Dernière du corpus à avoir été écrite, la Sonate en si mineur est peut-être la plus représentative de la personnalité musicale d’Emanuel Bach—une personnalité à la Janus, marquée par une tendance à rechercher de nouveaux développements stylistiques tout en rendant hommage à la formation reçue de son illustre père. Le premier mouvement plante remarquablement le décor, avec ce qui est avant tout un recitativo accompagnato prolongé, comme pour une voix soliste et un orchestre (respectivement sous-entendus par les indications de Bach pour les manuels piano et forte du clavecin). Peut-être Bach avait-il en tête les opéras et les scènes tragiques de son contemporain berlinois Carl Heinrich Graun, dont le célèbre Cesare e Cleopatra avait inauguré l’Opéra de la cour royale, à Berlin, deux ans auparavant. Tout le mouvement est une étude de résolutions imparfaites et de motifs mélodiques s’arrêtant en suspens. Bach manipule et magnifie avec brio la tension en juxtaposant à chaque moment de résolution motivique une interrogation ou une pause musicales immédiates. Vient ensuite un deuxième mouvement d’une tendresse désarmante. Le thème principal est, pour l’essentiel, une série de soupirs, précédant un thème secondaire pointé qui paraît merveilleusement gai mais qui, à chaque retour des soupirs, acquiert un côté poignant. Finalement, c’est la tristesse qui semble l’emporter, les mesures conclusives de rythmes pointés nous ramenant à l’Affekt initial. Le dernier mouvement est une parfaite invention à deux parties, le premier morceau du recueil dont on peut dire qu’il ressortit véritablement au haut baroque. Avec la modulation ascendante presque infinie de la seconde moitié de ce mouvement, Emanuel semble toutefois moquer un peu le style ancien car il suit le contrepoint jusqu’à sa conclusion narrative qui en fait on ne peut plus ridiculement trop. Les dix-huit dernières mesures, après un point d’orgue, sont réalisées en toute impassibilité—techniquement parfaites et imperturbables mais avec, peut-être, un petit sourire narquois, vestige des blagues des mesures précédentes. Peut-être aussi n’y a-t-il, au fond, rien de tourné en ridicule. Après être allé à l’opéra dans les deux premiers mouvements, Emanuel Bach rend hommage au plus grand de tous les compositeurs: son père. Il dit peut-être que, en fin de compte, une invention à deux parties vaut mieux que tous les modèles et costumes tout faits de la terre. Die Musik Carl Philipp Emanuel Bachs liefert wichtige Denkanstöße, wenn es darum geht, die allzu vereinfachte Grenze zwischen „Barock“ und „Klassik“ zu überdenken, die sich aus einer modernen Standardisierung des Konzertrepertoires ergeben hat. Der simpelsten Form dieser Haltung zufolge endet das Barockzeitalter mit dem Tod Johann Sebastian Bachs—der im Übrigen ein atypischer Vertreter des Barock war—im Jahre 1750, worauf die Klassik mit den späteren Symphonien und Streichquartetten Haydns um 1770 ihren Höhepunkt erreichte. Um die unklare Zeitperiode dazwischen bezeichnen zu können, wurden mehrere, oft unbefriedigende und behelfsmäßige Begriffe geprägt, wie etwa „Übergangsperiode“, „Rokoko“ oder—am allerschlimmsten—„Vorklassik“. Wie sind also die „Württembergischen Sonaten“ C.Ph.E. Bachs einzuordnen? Sie entstanden 1742–43 (und wurden 1744 herausgegeben, mit einer Widmung zu dem Herzog von Württemberg, einem ehemaligen Studenten des Komponisten), noch bevor J.S. Bach mehrere seiner wichtigen Spätwerke komponiert hatte, und sie sind so gelungen, so überzeugend, so gut komponiert und schön, dass sie nicht einfach als Werke einer Übergangszeit zwischen zwei großen Epochen eingestuft werden können. Wie soll der Umstand erklärt werden, dass sich der musikalische Ausdruck von dem des Hochbarock grundlegend unterscheidet, der angeblich noch etwa sechs Jahre blühen sollte? Sind unsere Kategorien überhaupt relevant? Haben wir uns von wahrhaft großer Musik abgewandt, weil wir unser vereinfachtes Modell der Musikgeschichte nicht hinterfragen? Anders ausgedrückt: Was entgeht uns dabei? Mit der ersten Sonate der Sammlung, der Sonate in a-Moll, vollzieht Carl Philipp Emanuel Bach eine äußerst kampfbereite Geste, um seine neue musikalische Sprache geltend zu machen. Die Anfangsmelodie des ersten Satzes könnte ebenso ein unverfrorenes Violinsolo von Vivaldi sein, so frisch und pikant ist ihr Aroma. Und der Umfang ist derart anspruchsvoll, dass die Oberstimme in weniger als drei Takten zweimal eine Undezime umspannt. Die Grundlogik des Satzes wird, ganz dem Sturm und Drang entsprechend, von Stimmungswechseln bestimmt, feuriger Zauber Momenten von honigsüßer Freundlichkeit gegenübergestellt. Unmittelbar vor der Reprise des Hauptthemas verwendet Bach ein Melodiefragment, dem ein aufsteigendes Arpeggio zugrunde liegt, das von zunehmender Dissonanz in der linken Hand begleitet wird, wodurch sich der Eindruck eines aufsteigenden Crescendos einstellt, bei dem die Möglichkeiten des Cembalos voll ausgenutzt werden. Das folgende Andante könnte fast eine Bearbeitung eines kammermusikalischen Werks sein, ein Trio für zwei Oberstimmen mit Bassbegleitung. Der lebhafte dritte Satz präsentiert sich ebenso revolutionär wie der erste und besitzt eine gewisse animalistische Turbulenz. Der treibende Puls der Anfangstakte verbindet sich nach der Hälfte des ersten Teils mit einer kühnen, abwärts gerichteten Sechzehntelkaskade, was dann das Hauptmotiv am Ende der beiden Hälften ergibt. Das Resultat ist ein Werk von überwältigender Brillanz. Möglicherweise hatte Emanuel Bach dabei das musikalische Feuerwerk Domenico Scarlattis im Hinterkopf, das sich in den damals bereits berühmten Essercizi von 1737 vollzog, die er ohne Weiteres aus Paris hätte bestellen können. Im Gegensatz zu den feurigen Tönen der ersten Sonate offenbart die Sonate in As-Dur Emanuel Bachs Gabe, die Nuancen der menschlichen Stimme am Cembalo zu imitieren. Auf eine aufsteigende Anfangsmelodie folgt ein rasches zweites Thema, dessen Intensität als Gegengewicht zu dem „Sängerterzett“ vom Beginn eingesetzt wird. Bachs einzigartige und eigenwillige musikalische Persönlichkeit kommt an gewissen Stellen zum Ausdruck, so etwa am Ende der ersten Hälfte des ersten Satzes, wo die Musik nach Moll wechselt und das emotional aufgeladene Kantabile durch den Einsatz von Dissonanzen dramatische Triebkraft erhält. Auch im zweiten Satz finden Stimmungswechsel statt—es handelt sich dabei um ein anrührendes Stück, wo das Umherspringen zwischen unzusammenhängenden Motiven fast in ein „Quasi-Rezitativ“ zerfällt. Wenn er die Grenze zwischen Prosodie und Lyrik verschwimmen lässt, werden Bachs literarische Einflüsse offensichtlich. Im letzten Satz, Allegro, kommt wiederum eine gewisse Deklamatorik zum Vorschein. Hier zeigt der Meister des intensiven und dramatischen Stils, dass er einen ebenso ausgeprägten Sinn für Humor besitzt. Was diesem lebhaften Fingertanz an „Bachischem“ Kontrapunkt fehlt, wird durch eine völlig andere Art des Zusammenspiels wettgemacht—nämlich das der Timbres und Affekte. Im ersten Satz der Sonate in e-Moll spielt Bach mit den Erwartungen des Hörers, was das Verhalten und die Rolle des „Hauptthemas“ anbelangt. Was ist das Hauptthema dieses Satzes? Die seltsam gezackten Gesten der ersten fünf Takte? Oder die Gruppen mit wiederholten Achtelnoten, wobei Arabesken zwischen den beiden Händen imitiert werden, auf die unnachgiebige Seufzer folgen? Muss ein Satz überhaupt ein definierbares Hauptthema haben? Dieses mehrdeutige Hin- und Herflattern wird im Mittelsatz, ein Adagio, fortgeführt, dessen viertaktiges Anfangsthema in raffinierter Weise durch das Verarbeiten gegensätzlicher Klangfarben, die über die beiden Manuale des Cembalos erzeugt werden, ausgedehnt wird. Darauf folgt ein wunderschön gearbeitetes Vivace im Dreiachteltakt. Noch deutlich mehr als die anderen Sätze aus der Württembergischen Sammlung ist dieser gemäß der deutschen Technik gefertigt, bei der die Melodien sozusagen aus Stein herausgemeißelt werden, was im Gegensatz zu den hellen Pastellfarben und unterschiedlichen Pinselstrichen der italienischen und französischen Musik steht. Hierbei handelt es sich um einen wahren aufklärerischen Totentanz, in dem ein ruheloser Tänzer von einem besonders sinistren antiken griechischen Chor begleitet wird. Beide Hälften des Satzes werden jeweils von einer flinken Coda abgeschlossen, wobei jede Sechzehntel von einer teuflischen Freude am Dissonanten und Bizarren besessen ist. Die brillante Sonate in Es-Dur gehört zu den sonnigsten und extravertiertesten Stücken aus der Mitte des 18. Jahrhunderts. Der erste Satz zeichnet sich durch seine unterschiedlichen melodischen Konturen aus und vermittelt im ersten Takt den Eindruck eines aus dem Wasser springenden Fisches, der dann sofort wieder zurückfällt, und bei jedem darauf folgenden Sprung in etwas unterschiedlicher Weise hüpft und umhertollt. Im Gegensatz zu dieser spielerischen ersten Idee setzt ein zweites Thema mit großem Pathos ein, bevor es einer Begeisterung nachgibt, die sich in extravaganter Weise mit absteigenden Tonkaskaden äußert. Hier zeigt Emanuel Bach seine wahre Kunst als Meister einer neuen Ästhetik, wenn er unvorbereitete Akkorde verwendet, ob konsonant oder dissonant, um so den affektiven Impuls seiner Melodien zu untermauern. Ein Komponist war nun nicht mehr gehalten, die barocke Methode zu verwenden, derzufolge die Harmonien als Zusammenfluss vorbereiteter kontrapunktischer Linien entstehen. Die fugalen Elemente des zweiten Satzes erinnern an den mittleren Satz der vorangehenden Sonate in B-Dur. Ebenso wie in jenem Werk wird auch hier das Konzept der Fuge als Topos oder auch als Requisite benutzt, um bestimmte emotional aufgeladene Intervalle zu betonen; in diesem Falle handelt es sich um eine aufwärts gerichtete Septime im Anfangsthema, auf die ein abfallender Halbton folgt. Mit einem zweiten Thema in Sechzehntelläufen sorgt Bach für harmonischen Schwung und lässt das erste Thema metrisch hervortreten. Im wundervollen dritten Satz wird Virtuosität mit einer kecken Dramatik kombiniert, indem eine Tonrepetitionsfigur dazu verwendet wird, Spannungsmomente anzutreiben. Der Komponist macht sich den Kontrast zwischen dem klangvollen tiefen Register und dem etwas schrill anmutenden Kantabile des schnell ansprechenden hohen Registers zunutze. Das zuletzt komponierte Stück dieser Werkgruppe, die Sonate in h-Moll, repräsentiert vielleicht am besten die vielseitige musikalische Persönlichkeit Emanuel Bachs, die sich durch eine Tendenz auszeichnete, neue musikalische Entwicklungen vorwegzunehmen, während er gleichzeitig der Ausbildung Tribut zollte, die er von seinem berühmten Vater erhalten hatte. Im Vorfeld wird im ersten Satz das Drama vorbereitet, indem ein quasi ausgedehntes Recitativo accompagnato erklingt, das eine Solostimme mit Orchester imitiert (die jeweils durch die bestimmten Anweisungen des Komponisten für das Piano- und das Forte-Manual des Cembalos bezeichnet sind). Möglicherweise dachte Bach dabei an die Opern und dramatischen Szenen seines Berliner Zeitgenossen Carl Heinrich Graun, dessen gefeiertes Werk Cesare e Cleopatra zwei Jahre zuvor an der Königlichen Hofoper in Berlin gegeben worden war. Der gesamte Satz ist eine Studie in unvollkommenen Auflösungen und melodischen Motiven, die mittendrin innehalten. Bach geht geschickt mit der Spannung um und steigert sie, indem er jeder melodischen Auflösung unmittelbar ein musikalisches Fragezeichen oder eine Pause gegenüberstellt. Darauf folgt ein zweiter Satz von einer gewinnenden Zärtlichkeit. Das Hauptthema besteht im Wesentlichen aus einer Seufzersequenz, worauf ein punktiertes zweites Thema erklingt, welches zunächst wunderbar vergnügt scheint, bei jeder Rückkehr der Seufzer allerdings melancholischer wird. Schließlich scheint die Traurigkeit überhand zu nehmen, wenn die Schlusstakte mit punktierten Rhythmen zu dem Anfangsaffekt zurückführen. Der letzte Satz ist eine vollendete zweistimmige Invention, das erste Stück der gesamten Sammlung, das wirklich dem Hochbarock angehört. Mit fast endlosen aufsteigenden Modulationen in der zweiten Hälfte scheint Emanuel Bach den alten Stil allerdings etwas zu verspotten, wenn er den Kontrapunkt zu einem völlig übertriebenen Schluss führt. Die letzten achtzehn Takte, die auf eine Fermate folgen, erklingen sozusagen mit einem Pokerface—technisch perfekt und mit kühlem Kopf, jedoch vielleicht mit einem süffisanten Ausdruck, der noch von dem Scherzen der vorangehenden Takte herrührt. Oder vielleicht wird auch überhaupt nicht gespottet. Nach einem Ausflug zur Oper in den ersten beiden Sätzen zollt Emanuel Bach dem größten Komponisten von allen Tribut—seinem Vater. Vielleicht sagt er, dass eine zweistimmige Invention letztendlich mehr wert ist als alle hübschen Bühnenbilder und Kostüme der Welt. On a personal note, these relatively early works from C P E Bach’s pen have struck a certain chord with me, perhaps because I found myself studying, performing, and eventually recording them at the same age that the composer himself wrote them. One clearly senses in these six sonatas a young man trying to find his own voice, an experience with which I can certainly empathize. I had the distinct honour of studying each of these sonatas in detail over an intense three-day period in cold and snowy Prague with Zuzana Ruzicková, whose unrelenting energy during mammoth day-long sessions provided a final source of inspiration a few weeks before my time in the recording studio. I take credit for all faults. On the other hand, whatever there is of value is all hers, for it was she who taught me how to ‘speak’ this music. The harpsichord used for this recording is based on the surviving harpsichords by Berlin court harpsichord-maker Michael Mietke (1671–1719); the current copy is designed and built by the team of Jan Becicka, Stanislav Hüttl, and Petr Šefl in Hradec Králové in the Czech Republic. The decision to have the 4' strings plucking more towards the midpoint of the string than the other registers results in a flute-like solo 4' register and 8' and 4' combinations that have a particularly singing quality. The tuning is based on an amalgam of various mid-eighteenth-century German temperaments, designed and executed by Petr Šefl. Ces six sonates relativement précoces de C. P. E. Bach ont touché, chez moi, une certaine corde sensible, peut-être parce que je me suis trouvé à les étudier, à les interpréter et, finalement, à les enregistrer à l’âge où le compositeur lui-même assura les avoir écrites. On y sent clairement un jeune homme en quête de son propre style—une expérience à laquelle je puis assurément m’identifier. Pendant trois jours intenses, dans la froide Prague enneigée, j’eus l’insigne honneur d’étudier ces sonates en détail avec Zuzana Ruzicková, dont l’énergie soutenue, tout au long de nos titanesques journées de travail, m’apporta une ultime source d’inspiration quelques semaines avant d’entrer en studio. J’assume toutes les erreurs. En revanche, si valeur il y a, c’est à elle seule que tout le mérite en revient, car ce fut elle qui m’enseigna comment «parler» cette musique. Le clavecin utilisé ici s’inspire des instruments qui nous restent de Michael Mietke (1671–1719), facteur de clavecins à la cour de Berlin; cet exemplaire a été élaboré et construit à Hradec Králové (République tchèque) par l’équipe de Jan Becicka, Stanislav Hüttl et Petr Šefl. La décision d’avoir le jeu de 4' pinçant davantage vers le milieu de la corde que les autres registres se traduit par un registre solo de 4' de type flûte et des combinaisons des jeux de 8' et de 4' particulièrement chantantes. L’accord repose sur un amalgame de divers tempéraments allemands des années 1750, conçu et mis en œuvre par Petr Šefl. In persönlicher Hinsicht haben diese relativ frühen Werke aus der Feder C.Ph.E Bachs eine Saite in mir berührt—möglicherweise weil ich sie im selben Alter studiert, aufgeführt und schließlich eingespielt habe, wie der Komponist sie seiner eigenen Aussage nach komponiert hat. Man spürt in diesen sechs Sonaten förmlich, wie ein junger Mann seine eigene Stimme sucht, und diese Suche kann ich gut nachempfinden. Mir wurde die große Ehre zuteil, jede einzelne dieser Sonaten ausführlich während einer intensiven, dreitägigen Phase im kalten und verschneiten Prag bei Zuzana Ruzicková zu studieren, deren unablässige Energie in Mammutsitzungen, die den ganzen Tag andauerten, eine letzte Inspirationsquelle war, bevor ich mich einige Wochen später in das Aufnahmestudio aufmachte. Ich lasse mir alle Fehler anschreiben. Und auf der anderen Seite, wenn es etwas von Wert gibt, so ist das ganz ihr anzurechnen, da sie es war, die mir beigebracht hat, wie diese Musik „gesprochen“ wird. Das Cembalo, welches für die vorliegende Einspielung verwendet wurde, ist den noch existierenden Instrumenten des bekannten Berliner Cembalobauers Michael Mietke (1671–1719) nachempfunden; dieses Instrument wurde von Jan Becicka, Stanislav Hüttl und Petr Šefl in Hradec Králové in Tschechien gebaut. Die Entscheidung, dass die Vierfuß-Saiten mehr im Mittelpunkt der Saite angezupft werden als die anderen Register, führt zu einem flötenartigen Solo-Vierfußregister sowie zu Achtfuß- und Vierfußkombinationen, die besonders sanglich klingen. Der Stimmung liegen verschiedene deutsche Temperamente der Mitte des 18. Jahrhunderts zugrunde, gemäß eines Entwurfs und der Ausführung von Petr Šefl.